I HATE WEEDS! We have been in our new home for less than a month and I think I have spent the majority of the time pulling weeds. We have about an acre of land and about 1/3 of the land is mulch covered in weeds. When we bought this house the allure was the house, the land, and the lake. The house is in great condition and doesn’t need much in the space we are currently living. The lake is beautiful, but the land, that is in need of major help. We knew getting into this house that the landscaping would be the biggest expense. We are letting professionals plan out the steps to take this fall and in the future, but for now, I have weeds! TONS of weeds! Living next to the lake means that anything we put into the soil is going to eventually end up in the lake. We also want to eventually plant in the soil so we don’t want to put anything into the soil that will completely ruin it. 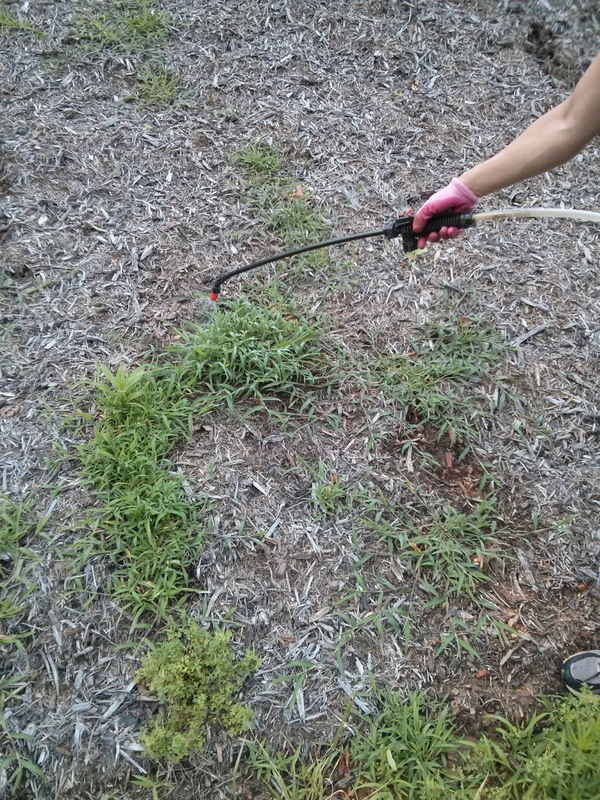 Based in my mother’s suggestions, we went the natural way to get rid of those wicked weeds and crab grass…Vinegar. There are natural weed killers all over the internet. They mostly all involve vinegar and other products like salt and/or dish soap. We used diluted white vinegar from the food store and our handy dandy backpack sprayer (see above) sold to us by the prior owner. He apparently killed the weeds using the other methods and would do this yearly. Apparently the backpack is a must for the amount of land we have to cover. This weed killer won't remove the actual weed plant, just kill it. After spraying the plant leaves with the vinegar, it took about a day and most turned brown. I still have to go out possibly spray again and then pull the dead plants, but it ended up looking much better than it did before. Before I cursed the windows in my house because I was constantly looking at the weeds grown on the hillsides, now not so much.